Since the last 3 decades new infection including the re-emergence of old infections have become a public health concerned as they tend to became pandemic with serious implication for the socio-economic and socio-political scenario of the global community. The facilitating factors include urbanization and destruction of natural habitats, climate change and changing ecosystems, changes in population of reservoir hosts or intermediate insect vectors and microbial genetic mutation, international trade and commerce, change in human demographics and behavior, lack of public health services and infrastructure, and antibiotic resistance. Figure 2 Routes of transmission, Malaysia to Kerala. It presents the variable picture. In Singapore it was associated with importing and slaughter of imported pigs from Malaysia were as in Malaysia the diseases progressed from the natural host “Fruit Bats” to amplification host (livestock) and finally to humanswhere as in Bangladesh it was due to the consumption of fruits and fruits products (raw date pam sap) contaminated with urine or saliva from infected fruit bat. In India, some cases human to human transmission has been reported.8 In most Nipah outbreaks in South Asia, the virus has displayed a “stuttering chain of transmission”, meaning that once the virus spreads from fruit bats to humans, it moves mainly to people in close contact with patients, such as family, hospital staff and caregivers. In this picture, nursing staff of Kozhikode medical college wear masks. Figure 3 Genome of Nipah Virus. Phosphoprotein (P): it role as a polymerase cofactor, enhancing polymerase processivity and allowing the encapsidation of the newly synthesized viral genomes and antigenomes. Phosphorotein of Nipah virus has an additional role in immunosuppression: blocking interferon signaling by binding host STAT-1. Diagnosis: RT-PCR is the main mode of diagnosis serum Neutralisation (SN) tests can also be done. Prompt and extraordinary response of the local population and local health authorities to meet the challenge. This was prompted by high literacy rate among the local population, better health infrastructure , adequate resources allocation coupled with mass awareness campaign etc launched by the stake authorities helped in “containing” the epidemic at a relatively earlier stage, unlike the once which had happened earlier in North Bengal and Bangladesh. High index of suspicion regarding the possibility of Nipah virus among the local doctors along with the prompt support and correct guidance provided by the Manipal Center of Virus Research enabled the medical fraternity to reach an earlier scientific breakthrough. India has a poor record of outbreak investigations. About 10,000 people develop encephalitis-like symptoms each year but never get a diagnosis. Some regions, such as Uttar Pradesh’s Gorakhpur and Bihar’s Muzaffarpur, saw thousands of deaths in repeated annual outbreaks before the causes were established. 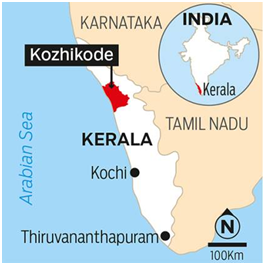 Against this background, the discovery of an exotic pathogen in the very second patient hit by an outbreak, as was the case in Kozhikode, has few precedents. Leroy EM, Kumulungui B, Pourrut X, et al. Fruit bats as reservoirs of Ebola virus. Nature. 2005;438:575‒576. Towner JS, Pourrut X, Albariño CG, et al. Marburg virus infection detected in a common African bat. PLoS One. 2007;2(8):e764. Li W, Shi Z, Yu M, et al. Bats are natural reservoirs of SARS-like coronaviruses. Science. 2005;310:676‒679. Das. S. Blood Safety: New challenges & Opportunities in Developing Nations. J Bacteriol Mycol. 2017;4(5):146‒148. Chua KB, Crameri G, Hyatt A, et al. A previously unknown reovirus of bat origin is associated with an acute respiratory disease in humans. Proc Natl Acad Sci USA. 2007;104:11424‒11429. Lu G, Liu D. SARS-like virus in the Middle East: a truly bat-related coronavirus causing human diseases. Protein Cell. 2012;3(11):803‒805. Das S, Harendra Kumar ML. Distribution of ABO & Rh Blood Groups among Blood Donors of Kolar: A 5 Years Study. Journal of Clinical and Biomedical Science. 2013;3(2):55‒59. Chua KB, Bellini WJ, Rota PA, et al. Nipah virus: recently emergent deadly paramyxovirus. Science. 2000;288(5470):1432‒1435. Chua KB. Nipah virus outbreak in Malaysia. J ClinVirol. 2003;26(3):265‒275. Field H, Young P, Yob JM, et al. 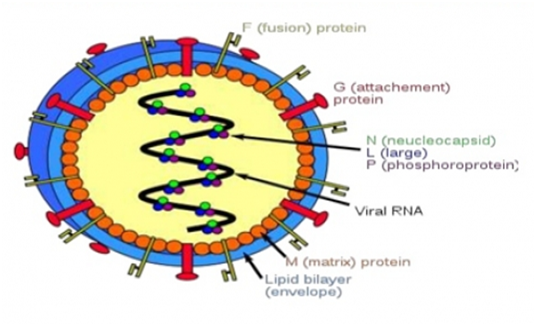 The natural history of Hendra and Nipah viruses. Microbes Infect. 2001;3(4):307‒314. Lamb RA, Parks GD. Paramyxoviridae: The viruses and their replication. In: Knipe DM, Griffin DE, editors. Fields Virology. Lippincott Williams & Wilkins, Philadelphia. 2007. p. 1449‒1496. Eaton BT, Broder CC, Middleton D, et al. Hendra and Nipah viruses: different and dangerous. Nat Rev Microbiol. 2006;4(1):23‒35. Pallister J, Middleton D, Broder CC, et al. Henipavirus vaccine development. J Bioterror Biodef. 2011;S1:005. Das S. Emerging Infections in Pregnancy. J Bacteriol Mycol. 2017;5(7):442‒445. © 2018 Das. This is an open access article distributed under the terms of the Creative Commons Attribution License , which permits unrestricted use, distribution, and build upon your work non-commercially.